Pronounced "Free-den" according to a Friden advertisement, the company was founded in 1932 by Carl Friden to manufacture his highly advanced mechanical calculator which was capable of addition, subtraction, multiplication, and division. Although Carl died in 1945 the company continued under the the guidance of Walter Johnson, who had provided financial backing. 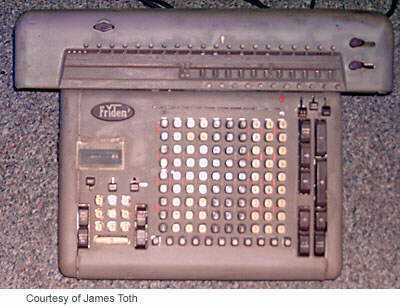 In 1964 there were two major developments: Johnson sold Friden to the Singer company, of sewing machine fame, and Friden put on sale one of the first all-transistor electronic desktop calculators, the EC-130 followed by the EC-132 which had the square-root funtion. 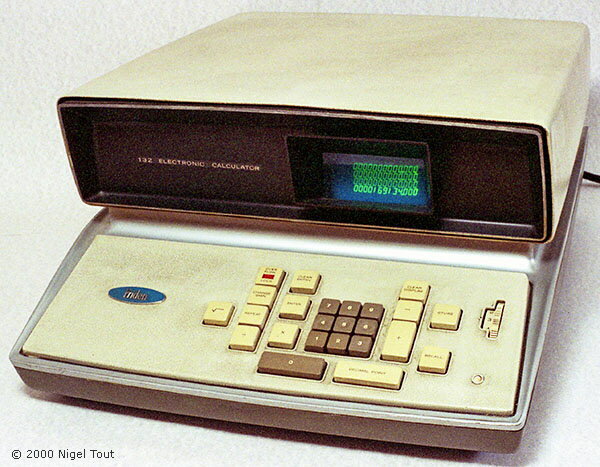 Singer-Friden sold a series of desktop and hand-held calculators into the mid-1970s. Models were manufactured in the U.S.A. and also in Japan, with some desktop models being made by Hitachi. A mechanical calculator that can extract square roots. One of the first transistorised calculators, launched in 1964. Pocket-sized calculator, manufactured by Commodore for Singer. For further photographs of Singer-Friden hand-held calculators see the Calculator Photo Library on this site.